Camping - Be Safe While Camping! Make sure the fire is 15 metres away from buildings or tents. Ensure you have a pail of water and a shovel to control the fire. A small fire will also keep cooking tools from blackening and let you get close enough to cook. If you start a campfire, make sure you keep it under control and put it out before you leave. No more smoke comes from the ashes. If you see a fire burning with no people near it, tell an adult immediately. No matter your age or experience, you should take a boating safety course. Please visit the Office of Boating Safety for more information. Click here for the Boat Smart Exam. The Office of Boating Safety recommends that all boaters take a boating safety course. Having more knowledgeable boaters on our waterways will help reduce the number of injuries and incidents and will save lives. To find out where you can write the test and/or take a course in your area, review this List of all TC-accredited course providers. Youth under 16 years of age may not operator boats with motors over certain horsepower limits unless someone 16 years of age or older is in the boat and directly supervising them. Youth under 16 may not operate a personal watercraft (PWC) under any circumstances. Are you old enough to operate a motorized boat? Find out from the chart below. These restrictions do not currently apply in the Northwest Territories and Nunavut. Remember that these restrictions are separate from the requirement for proof of competency and both must be followed.This means that youth under 16 require proof of competency to operate any motorized boat, supervised or not. Outdoors Card and Hunting LicencesTo hunt in Ontario, most residents need a hunting version Outdoors Card and the applicable licence tags or licences. Ontario recognizes two types of resident hunters: gun hunters and non-gun hunters. Gun Hunting — The Class H1 Outdoors Card allows hunting with all the methods permitted under the Fish and Wildlife Conservation Act (guns, archery and falconry). To qualify for a H1 Outdoors Card, the applicant must provide proof of passing both the Ontario Hunter Education Course exam and the Canadian Firearms Safety Course exam. Non-Gun Hunting — The Class H2 Outdoors Card allows hunting with all the methods permitted under the Fish and Wildlife Conservation Act except guns (primarily archery and falconry). To qualify for a H2 Outdoors Card, the applicant must provide proof of passing the Ontario Hunter Education Course exam. Outdoors Card and Fishing LicencesOntario residents need an Outdoors Card to fish in Ontario if they are at least 18 years old but have not reached their 65th birthday. As a resident of Canada, your fishing-version Outdoors Card must have a fishing licence tag attached to it in order to be a valid licence. If you are a non-resident of Canada, your basic licence form must be signed and have the appropriate licence tag attached to it to be valid. Keep in mind that your Outdoors Card or non-resident licence is not transferable; it provides privileges to you alone. Remember to carry it with you at all times when fishing. If a Conservation Officer asks to see your licence, the law states that you must show it. Please remember that you are visiting the animal’s homes. Please be safe and do not approach any wild animal. You can also make sure to not leave any food around for the animals to eat. Click on the following for tips on how to behave with wildlife. Trailers come in many shapes and sizes. Pulling a trailer requires extra care and attention. A trailer puts extra weight on your vehicle and increases the space you need to drive and stop safely. Trailer safety involves some simple and important rules. For Trailer Safety information, please click here. Remember to check your Fire Alarms and Carbon Monoxide monitors each spring when you open up the trailer for the season. Always install new batteries for the upcoming summer. 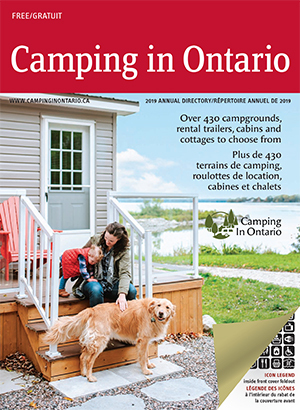 Many people enjoy the Ontario outdoors in spring and summer. With increased time spent outside, it's important to know what to do when threatening weather approaches. Lightning is the most common danger associated with thunderstorms. Thunderstorms may also produce very strong winds, large hail, heavy rains and, in rare circumstances, tornadoes. Please take a few minutes to familiarize yourself with the safety tips below. A good way to stay current with the latest weather forecasts and warnings is to listen to Environment Canada's Weatheradio broadcasts. Most of Ontario's Weatheradio network transmits continuous weather information on special VHF-FM frequencies. Compact, battery-powered Weatheradio receivers are available in most electronics stores to monitor these broadcasts. At a few selected locations, low-power broadcasts are transmitted on regular AM or FM bands. Environment Canada's Weatheradio Web site has a full list of transmitter locations. Being aware of your surroundings is another important part of staying safe outdoors. Identify in advance the places where you could take shelter if threatening weather approaches. Then, if the skies darken and you see lightning, you will know what to do and where to find the most appropriate shelter. from the Weatheroffice Environment Canada. Here are some tips on what to do if you encounter the following phenomena. Lightning, Strong Winds, and Large HailIf in a tent or tent-trailer, move to the closest comfort station/washroom or your hard-topped vehicle. If no shelter is available, seek refuge deep in a thick stand of trees. If no trees or only solitary trees are nearby, then find the lowest-lying area. Crouch down and cover your head. Heavy Rain/Flash FloodsAvoid camping close to streams or rivers as heavy rain can cause water levels to rise rapidly. Never cross rain-swollen streams or rivers as the undercurrents could carry you downstream. If flash flooding does occur, get to higher ground immediately. TornadoesMove to a campground comfort station/washroom. Crouch and cover your head. If there is no comfort station or washroom nearby, evacuate your tent or camper van. Lie down flat in a low-lying area and cover your head with your hands. DO NOT get into your vehicle to escape a tornado! Strong tornadoes can overturn vehicles. Click here to download the French version of this document. Click here to learn more about Environment Canada's Weatheradio.